this morning about the picnic shoulder that I have on the egg. We were discussing the weekend camping plans and of course FOOD. He told me that our local meat market was now carring rabbit and quail, so immediately I could taste smoked rabbit and quail. Off I went. Now the shoulder is just about done and I'd like to try my purchases. Does any one have any idea on temps for both? Also a general type of rub? Quail is really good with Tsunami Spin. You can do them whole or spatchcock. I would do them direct at about 350* on a raised grid. Never done wabbit on the egg. I have yet to purchase any DP products (I think that is what Tsunami Spin is, wright?). Thanks for the info, I was trying to decide whether to grill or smoke. Of course frying always works but man I don't need that. Man, that looks really good. I'm not even sure what paella is. I've heard of it, but don't think I ever tried it. I've only done quail once, so can't really comment, but have been doing rabbit for some time both on and off the Egg. There are a bunch of problems with rabbit. I've never had on with much of any fat. The meat is mostly covered by silver skin. The pieces are small, and can be easily burnt. The up side is that commercial ones have a very nice mild, altho bland flavor, and I've never had one that I would consider tough. The best Egged rabbits I have made were done with a tandoori marinade. I've made the marinade mixes myself, but have found commercial Indian products to be better. If you have an Indian or Oriental market nearby, check them out. Mix the spices with yogurt. Cut the rabbit into quarters. If you do them whole, the flavors will not penetrate as well, and they are pretty hard to turn. Pierce the flesh all over, and completely coat the pieces with the yogurt marinade. Let sit 8 - 16 hours. This will soften the silver skin, and allow the flavor to really soak in. Leave a lot of the marinade glop on the pieces. It will cook down, and leave a nice sort of saucy coating. I don't have my notes at hand, but I believe I usually do them at about 350 dome for a fairly quick roast. I do them direct, elevated, and turn frequently after the first half hour. Pull when the loin (along the rear back) reached 140. Let me know if the rabbit is less then 30 dollars. It is that high around here and that is for frozen. Check, thanks for the info. That sounds like it would be really good. This was about a 3 lb frozen rabbit. It was $12. I didn't know if that was a good price or not. Compared to buying a license, shells, finding a friend with a dog, and trying to find a place to hunt, and waiting till November... :huh: ...I suppose it was. From executive chef Joseph Humphrey of The Restaurant at Meadowood in Napa Valley, Calif.
Heat the grill to medium. Lay the birds flat and season them with salt and pepper. Brush the grill with the olive oil and place the birds, skin side down, on the grill. Cook until rare, for about 8 to 10 minutes. Flip the quail and grill until medium well and the juices run clear, for about 3 minutes. Place the birds on a platter and lightly cover them with foil to keep them warm. Spoon 2 tablespoons of Romesco Sauce in the center of 6 plates. Cut each quail into 4 pieces (2 breasts and 2 legs), and arrange the pieces on the pool of Romesco Sauce. Serve with lightly sauteed Swiss chard or spinach. If I went with spatchcock quail, how long do I cook per side at 350F? my grandmother used to cook quail in a tomato sauce and poured it over pollenta. i really miss my grandmother. Now -- Is that the bunny kind, or the Welsch kind...? For Quail on the Weber I always did them at 350 with the coals pushed to one side. Ive done them once on the EGG 350 direct to 170 in the breast, slightly over done. Next time I'll go indirect. A little butter and thyme under the skin is nice. Rabbit I have only done in a clay pot in the oven.It is very lean so the liquid in the clay pot keeps it moist. We cook rabbit all the time. There is a pic of it just fried in my avatar. Last time I used a platesetter up, pan of water. Heavily smoked it at 350° for about an hour. Flipped it over half way. Now wild rabbit is tougher, I make several slices to the bone on all pieces to keep it tender. I rubbed it with peanut oil and seasoned it with garlic, salt and pepper. Always use fruitwood, usually apple. welsh "rabbit" is actually "rare bit". that tehre in the pan is rabbit. good stuff! Thanks, I'll save that one. Sounds good. Beats me, I tried to find out what I could, but unfortunatly the help today was just that..."help" as in-only knows how to ring up the sale. Sounds great to me "mom' that's about what I was intenting to do. Just was confused about how to season. Thanks for the tip. The KISS method it is. I can't remember exactly but it's not long. 12 - 15 minutes I think maybe less. I remember the thigh temp at 145*. I'll check when I get home and answer you. we like to stuff the quail. Spatchcock works well also. 1 Cook Rice, Basmati or Jasmine preferred, Use 1/3 orange juice by volume of total liquid used to cook rice. 2 Mix cooked rice w/ nuts ( pignoles or pecans chopped), chutney, scallions, stuff quail, works well w/cornish game hens, just takes more. ingredients to stuff birds. Use: pepper, salt,poultry seasoning whatever you like for rub.. Stuff birds w/mixture. 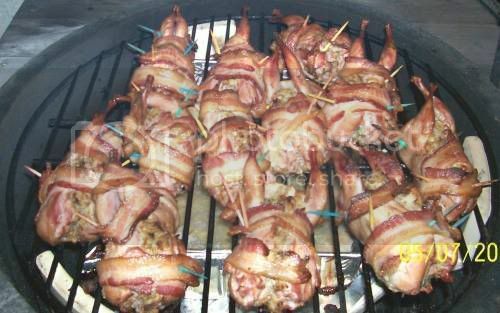 1 Wrap birds w/bacon , may take 2-3 pieces to totally wrap quail, cornish lay 2-3 pieces on breast and cook indirect breast up. For quail skewer w/large tooth picks or something else to hold the bacon. 2 Place in oven baking dish on rack to keep drippings underneath or place on BGE and grill using indirect method. Bake 325-350 F for 40-50 minutes until bacon is crispy, Start quail birds breast down, and turn breast up 1/2 way into cook. "V" rack works well for cornish, cook breast up with bacon strips. 1 Mix the sauce ingredients in a pan on low heat, add raspberry jam first. Tablespoon Dijon, Tablespoon Balsamic vinegar. Lemon juice and seasoning. Bring to slow boil and stir; adjust to your tastes. Orange marmalade may be substituted for the raspberry. 2 Rest 10 minutes. Serve. If Egging be careful not to let the drippings flare and burn bacon/birds. Great reheated next day. I can't find the time/temp for quail. I just moved and I don't think my info is unpacked. I generally don't use recipes but I do refer to The American Culinary Institute textbook for times and temperatures. There isn't anything in there for quail cooks. You should be able to find something on the internet cause quail is one of the oldest foods. I know it compares to duck and pheasant for temp and it can safely be cooked on the medium side.